Hamilton Conservation Authority, located at the western end of Lake Ontario, is the area's largest environmental management agency, and is dedicated to the conservation and enjoyment of watershed lands and water resources. Hamilton Conservation Authority will work to ensure healthy streams and healthy communities in which human needs are met in balance with the needs of the natural environment, now and in the future. To lead in the conservation of our watershed’s natural environment. Christie Lake offers activities such as hiking, swimming, boating, fishing, biking, picnicking, and even disc golf! One of the most beautiful lake settings on the Niagara Escarpment. This park spans 93 hectares along Lake Ontario and offers everything from swimming, biking, birding, picnicking, and more. The Lower Falls is a 5.5-metre classical waterfall, and the main Upper Falls is a 33.8-metre ribbon waterfall. The Devil’s Punch Bowl is one of the Niagara Escarpment’s most amazing sights, created at the end of the last ice age by huge melt-water rivers that plunged over the Stoney Creek Escarpment, thus carving the Punch Bowl and gorge. The Dundas Valley is one of southern Ontario's most spectacular natural treasures. Highlights of the 1,200-hectare conservation area include lush Carolinian forests, colourful meadows, cold-water streams, stunning geological formations and an array of rare plants, birds and wildlife. Venture through the Eramosa Karst; filled with underground caves and streams, meadows and forests! As one of the watershed's most unique natural gems, it's the perfect location for hiking, nature appreciation and education. A magnificent 80-hectare park with superb marina facilities in Stoney Creek. It's the place to be for a swim in Lake Ontario, family camping or a picnic for groups of any size. This unique area, was originally an abandoned quarry. The site was rehabilitated, resulting in the creation of a rare type of wetland, a fen and is the perfect spot for a hike! Located on the escarpment brow, the area is noted for its panoramas, and views to the forested depths of the gorge below. 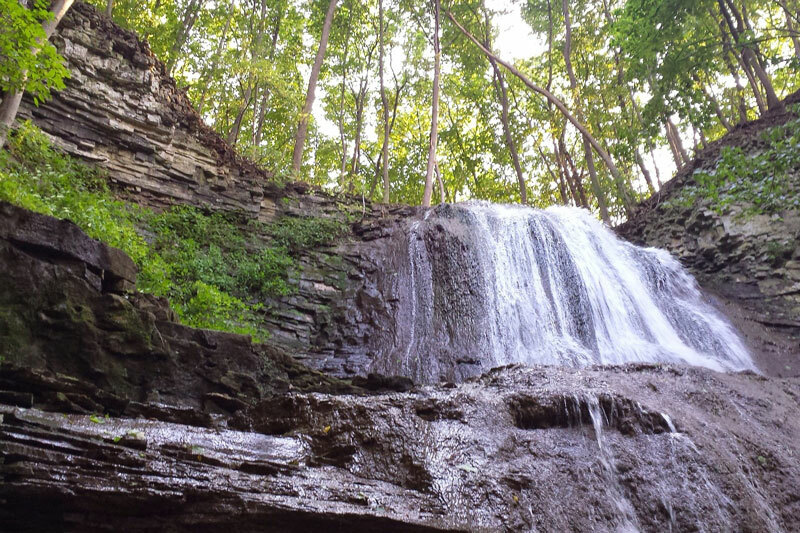 The area features two beautiful waterfalls: Webster and Tew Falls. Considered a significant natural area, its bedrock exposures are considered an Earth Science Area of Regional Significance and features Tiffany Falls and Washboard Falls. This 300-hectare area offers the feel of the north, right in your backyard and is a mecca for campers, anglers and outdoor lovers alike. In addition to our larger conservation areas, HCA also offers 3,031 hectares of natural conservation areas. Each area is unique, and is an excellent opportunity for getting out and enjoying the great outdoors. Enjoy a leisurely day in the country as you stroll through over 35 historical buildings, including log buildings, one-room school house, railway station and more! Westfield offers many events from March to December, with highlights including the Maple Syrup Festival, Ice Cream Carnival, Halloween and Christmas. Take summer poolside fun to the next level! Wild Waterworks offers one of Canada's largest outdoor wave pools, 4 tube slides, 2 body slides, an Eazy River and Little Squirt Works!